MoonMarble.com - Game Cobbles Asst. Bulk Marbles → Cobbles - approx. 22mm or 7/8" → Game Cobbles Asst. The 7/8" diameter game marble may be purchased in an assortment of the basic 6 colors: red, yellow, green, blue, black and white. They are also available in assortments of 4 or 8 colors (temporarily out of stock). If you would like a custom assortment other than the options listed, specify in your item notes which colors you would like to order. 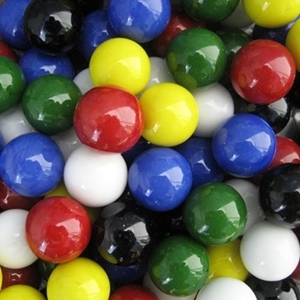 These marbles are sold in packs of 24, 60, 100, or a 600 count case. You will receive equal or nearly equal numbers of each color in the chosen assortment. Sizes and colors may vary slightly. The 60 count replacement set is only available in the basic 6 color assortment with 10 marbles of each color. Includes 100 marbles of each of the basic colors; red, yellow, green, blue, black and white.